Dubai, UAE, December 19, 2018: TAMANI Marina Hotel & Hotel Apartment in Dubai, located right in the heart of Dubai Marina, delights guests with generous offers during the festive season. Festive Lunch at Café Society – Unwrap the festivity and rejoice with family and friends with a sumptuous festive-themed spread. A Set Menu of traditional and international mouthwatering dishes and savories awaits you to immerse in including the roasted Turkey with all trimmings and a selection of all-time favourite desserts. Celebrate while the live entertainment adds fervor to the occasion. All that and more for AED 200 per person (for adults), and AED 100 per person (for children below 12), from 12:00 pm to 15:30 pm, on December 25. Turkey To Go – Leave the stress and strain of preparing the most anticipated meal of the year. Café society’s takeaway menu, including the traditional roasted Turkey with all trimmings, comes alive with a signature selection of flavours to make a festive feast beyond compare. Spread the table with potato gratin, steamed vegetables, hammour, prime ribs and date cheesecakes. Turkey prices start from AED 350 while delivery available within certain areas at AED 100. New Year’s Eve at the Pool – Welcome the year 2019 in a stylish celebration featuring a lavish buffet with live stations including barbecue and sushi, with sparkling juices. 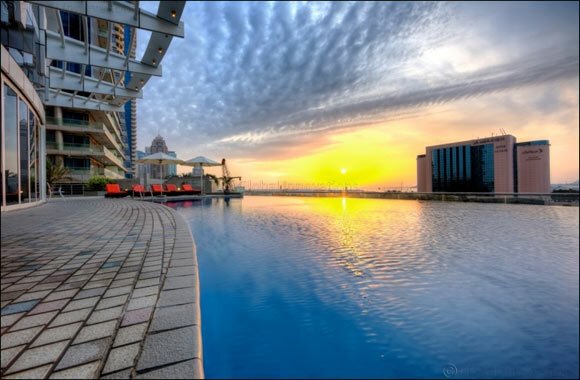 Make this year farewell memorable by enjoying the exquisite views of the Dubai Marina. Light music will bring the night to life until the clock strikes midnight to launch the dazzling fireworks display from the Atlantis to Jebel Ali. Kids also have their own dedicated buffet and play area to enjoy. The New Year’s Eve buffet is priced at AED 350 per person, starting from 7:30 pm till 1:30 am, on December 31. Donate with a smile – Relish delicious food on a delectable spread at Café Society and donate to the needy with a smile. In one of the most creative initiatives launched for this festive season, Café Society creates #SmileWithCafeSociety on Instagram, wherein the café will donate two dirhams per social media post of a guest smiling while at Café society. Reflecting the spirit of the festive season, this initiative is valid until 31st December, 2018.